Few airlines in the world take product consistency as seriously as Delta. When it inducted the Airbus A220 into its operations, the carrier went to great lengths to ensure this small but extremely capable mainline aircraft is as similar to its legacy Airbus and Boeing narrowbody fleets as possible. In almost all regards, it met or exceeded its own standards. After years of retrofit programs, every one of Delta’s Airbus A320s, Boeing 737s, and Boeing 757s offer very similar products, and the new A220 is no different. 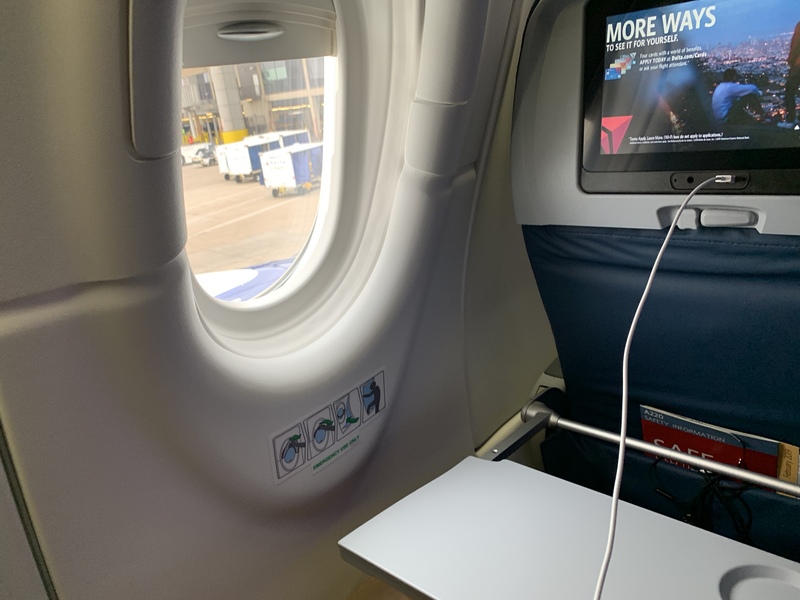 It features nose-to-tail seatback entertainment with 110-volt power and USB ports at all seats, as well as 2Ku satellite Internet from Gogo. Up front, the aircraft features 12 Collins Aerospace MiQ First Class seats pitched at 37 inches, although the bulkhead row lacks a cutout for passengers’ feet, leaving that row feeling quite tight compared to the others. The rather small Comfort+ cabin contains just 15 extra legroom seats pitched at 34 inches, while the 82 Main Cabin seats range in pitch from 30 inches up to 32 inches. Most Main Cabin seats maintain an exceptionally comfortable 18.6-inch width, the widest in Delta’s domestic fleet. With its large windows and generously wide seats, the A220 is a very comfortable ride in nearly any seat. 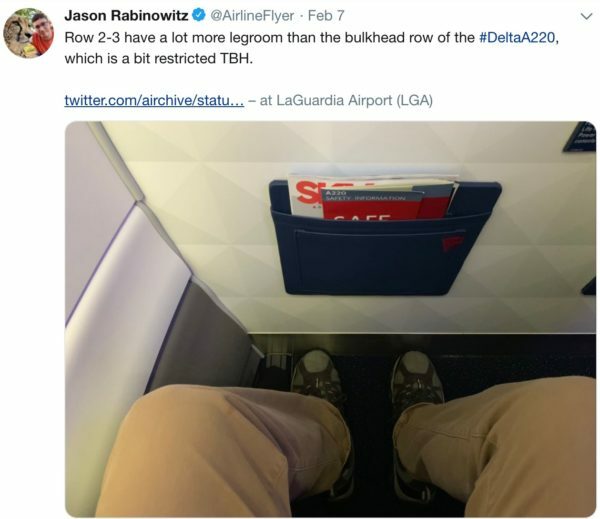 The biggest attraction on board Delta’s A220 is actually something a regular passenger will never know about, and that’s by design. The A220 features the new joint Gogo and Delta Flight Products (DFP) hybrid wireless seatback entertainment system. 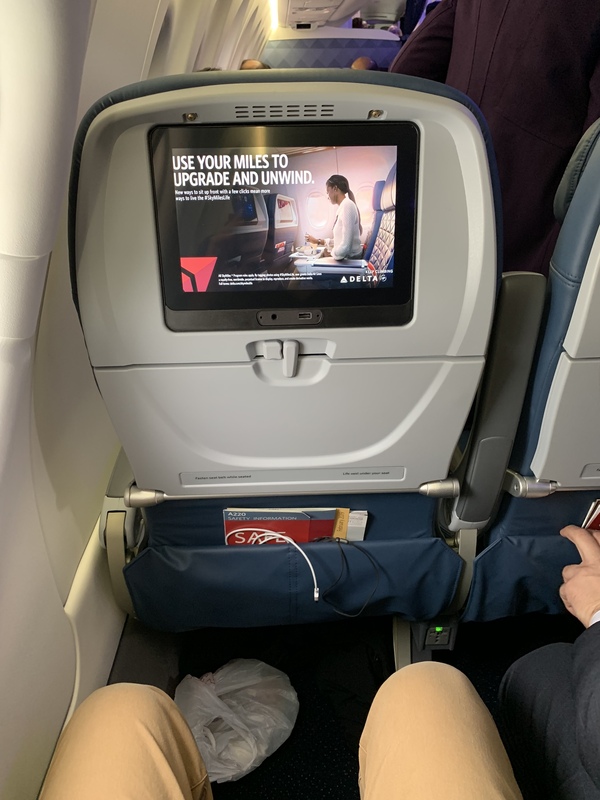 While Delta has exclusively installed seatback systems provided by Panasonic Avionics in the past, the airline has developed its own in-house system for future retrofits of other aircraft. For a first generation system, DFP and Gogo knocked it out of the park. The user interface, look and feel of this system exactly mirrors Delta’s older generation Panasonic systems. To the passenger using the system, there is no difference. The welcome screen, menus, and content selection screens are all an exact replica from the Panasonic systems. In fact, the new system seemed to be more responsive and quicker than the Panasonic systems I have used on Delta in the past. The reversible USB-A port kept my busy iPhone fully charged up, though I would like to have seen some future-proofing with a USB-C port as well. The DFP system does not allow for Bluetooth audio, which is another feature I would like to see added in the future. The massive content catalogue on board this medium-range aircraft rivals or bests what most long-haul airlines offer; there’s something for everyone to watch. Even though content is streamed wirelessly to the individual screens, I experienced no lag in video playback while initially loading videos, or while scrubbing through the timeline while playing something back. This is something many legacy systems struggle with. That is not to say the new system was perfect, however. The massive content catalog was not properly categorized, making it difficult to search for the right movie. Gone with the Wind is not a science fiction movie, nor is Grease a fantasy film. 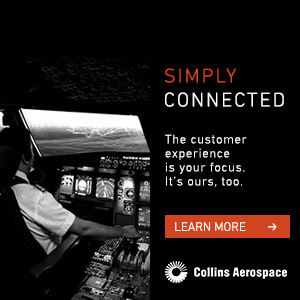 The bulk of the problems I experienced involved the Collins Aerospace Airshow product, which is new to Delta and a break from its past use of FlightPath3D’s 2D mapping software. The initial load of Airshow took several minutes as the system extracted more than 14,000 files and passengers waited for several minutes. The Airshow product contained more glitches than a final release product should, including constantly displaying the air speed as 999 knots and showing the aircraft banking to the right as it actually banked to the left. 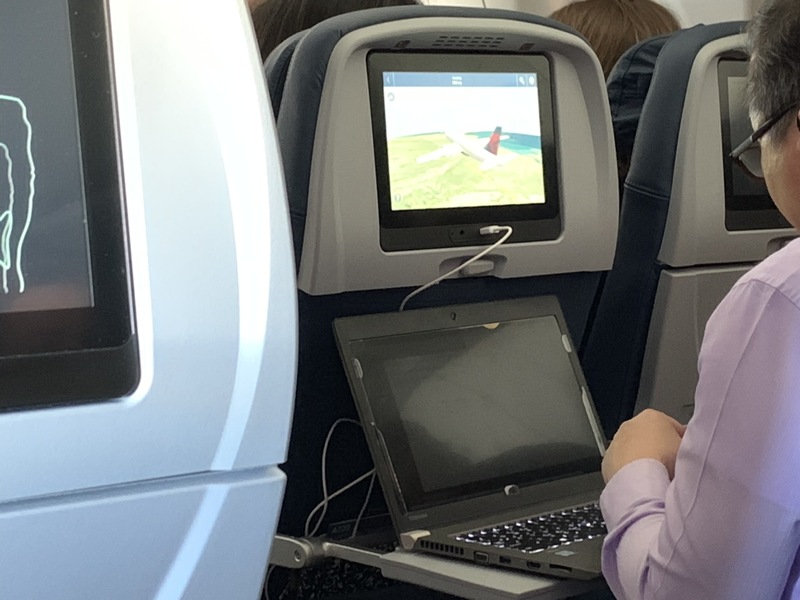 Delta recently announced it has teamed up with Gogo to provide live TV content to its aircraft with 2Ku, integrating the 18 or so live channels right into its Panasonic seatback systems on other aircraft. On the A220, however, that hasn’t happened. The live TV option was nowhere to be found on the seatback system, and was relegated to the Wi-Fi portal to be streamed to individual devices. 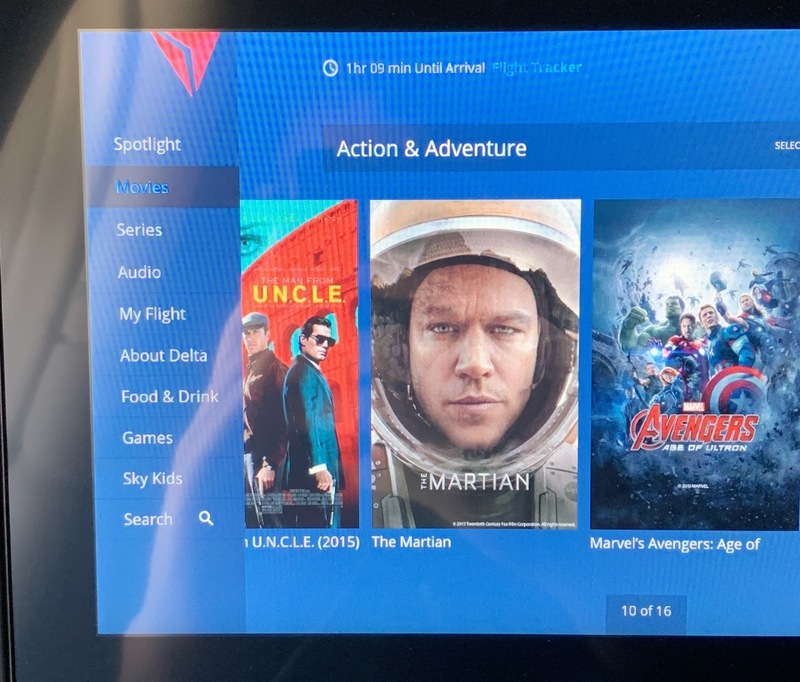 Delta has been able to display live TV content on its legacy Panasonic systems, so this is an odd omission. The live content streamed well, but with a significant time delay. The feed appeared to be 5-7 minutes delayed, which if following a sports event on social media would render the feature quite useless. Overall, Delta has hit a home run with its Airbus A220. At the end of the day, many passengers still don’t know what type of aircraft they’re on, be it an A319, A220, or 737-900ER. On Delta, however, it may not really matter. Aside from the much larger windows and 3-2 seating configuration in Main Cabin on the A220, there’s not much else to set these aircraft apart, and that’s exactly how Delta wants it to be. Reversible USB-A? Please explain more! Meaning you can put your USB cable in the port facing either direction. There is no “wrong” way. If you have usb-c its all same. Pretty sure, you are iPhone guy. Just keep in mind those Android/Windows users for now. I wonder what is the damage rate gonna be like. I used to have a car charger with this “reversible” design, the port either failed after a few months or did some damage to the USB cable’s contact point. The angle and force you plug and unplug the cable is the key here. Does it have the in-flight fart filtering system? Grease is indeed a fantasy film. I used to fantasize I’d get to marry Olivia Newton-John. 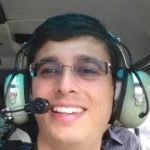 Great article and review. Helpful to know to avoid the bulkhead seats if possible in future flights on the A220. I do find the Delta infotainment system the easiest to use; glad to know they have kept/ improved it. Glad I came across this review. It is nice to see seats that are wider than 18″. Boeing’s 777 with 10 seat abreast and 787 with 9 seat abreast should be avoided. I rather stay home than flying with the 777 and 787 in a dense economy configuration. For the 787, only Japan Airlines has 8 seat abreast in economy. For the 777, probably only 30% have 9 seat abreast in economy. 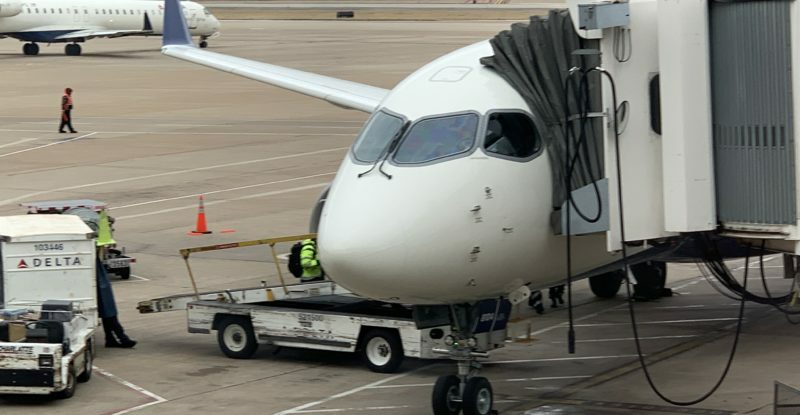 What routes will Delta be flying the A220 on? Has that been determined? Good detail Jason. So far it is just New York LGA to Boston and Dallas to start. After that, it will mostly be routes with high percentages of business travelers. I flew on this new Airbus on April 7th and it was awesome. Felt like 1st class without the meal. My phone didn’t charge, live TV option never worked on either flight, not to mention the pause feature was not functioning properly and finally after just randomly selecting buttons it actually stopped and I was able to adjust the volume. This issue was also with my boyfriend’s screen as well. Sorry, but you definitely did not fly a Delta A220 from ATL to LAS. Delta has had the A220s in service for less than a week, and they have exclusively served LGA-BOS and LGA-DFW, nothing else. I don’t know what aircraft type you fly on, but it was not an A220. Grease is considered a “fantasy film” because it’s a musical. What’s the deal with that janky Toshiba laptop? Yikes. Please, do s tories for the majority of users: the Economy Class!